Nearly a decade of extra life — that’s what you get when you move away from eating animal foods and toward a plant-based diet. This is really exciting science for anyone seeking healthy longevity (and who isn’t?)! According to a recent report on the largest study of vegetarians and vegans to date, those eating plant-based diets appear to have a significantly longer life expectancy. Vegetarians live on average almost eight years longer than the general population, which is similar to the gap between smokers and nonsmokers. Seven-year-old Owen Hoskins was so fearful about going outside that he could not leave his house. But then a three-legged dog named Haatchi, an Anatolian Shepherd, came into his life and everything changed. “Difficult” is actually a complete understatement: Ten months ago, Haatchi was found tied to a railway line. He had been hit by a train and was found “cowering, with a mangled tail and back leg.” Amazingly, he survived all that trauma. A veterinarian operated on Haatchi and had to amputate his tail and one of his legs. Haatchi had an immediate effect on Owen once they met. Once scared of strangers, Owen “now wants to talk to everyone about Haatchi and wants to go out all the time to dog shows,” enthuses Drummond who adds that “the difference we see in [Owen] can’t be put into words.” Haatchi has helped with Owen’s medical needs which can require hospitalization. Haatchi even takes “medicine” (a mix of manuka honey, salmon oil and supplements) to help Owen take his. Every parent knows the bittersweet ache of watching their children grow and leave the nest, but what happens when your baby is not yet two years old and can already run as fast as a car? 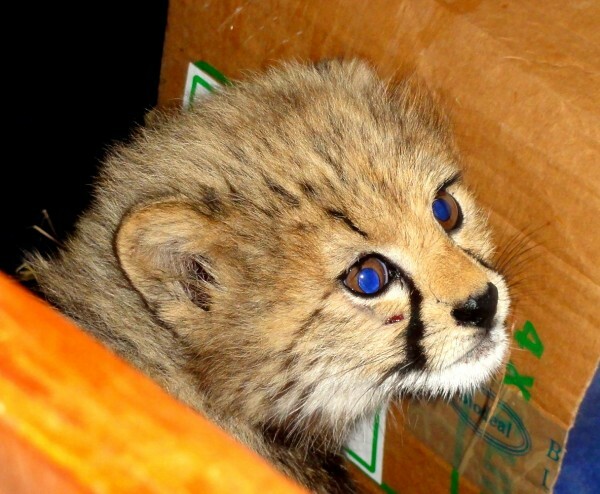 No one knows exactly how a one-month-old cheetah cub made her way under the fence of the Ol Pejeta chimpanzee sanctuary in Kenya in October of 2010. It’s no small miracle that sanctuary workers spotted her before the apes could make a meal out of her, yet great concern set in after an extensive search turned up absolutely no trace of the cub’s natural mother. With nowhere else to turn, sanctuary staff loaded the little cheetah onto a jeep and they set off together on a journey into the world of mankind. Three conservationists from the Amboseli Trust for Elephants are heroes after they saved an 8-month-old elephant that had fallen into a man-made well in a Kenya national park and then reunited the calf with her mother. The heartwarming rescue operation was captured on video and has been viewed by thousands. Volunteers in two jeeps rushed to the flats in the Amboseli National Park when they heard about the calf falling into a shallow well. They knew they had to act quickly before herders would arrive to water their cattle and force the mother elephant to abandon her baby. The wells which are dug by the Masai tribesmen who live around the national park have become an increasing problem between the animals and humans that share the land. “The baby elephant was too small to crawl out on its own and would have died without the help of rescuers. If the elephant dies, it ruins the well, angering the Masai who live nearby,” reported the Associated Press. Please make a pledge. If you pledge for one of the books you’ll get it for only a little more than you would buying it online or in a store. If you buy multiple copies they’ll be as inexpensive or even less. Thomas Ramey Watson puts up a cloud of appealing detail for the life of the psychotherapist and his extraordinary Afghan hound. October 20 was the second annual International Sloth Day! Organized by Colombia’s Fundación AIUNAU (a wildlife rescue non-profit), the day aims to raise awareness of sloths and the challenges they face. It’s a confusingly cute picture: tabby cat lies in a box, partially buried in a pile of fluffy yellow chicks. The downy mob is crowded into a corner of the box and one chick is perched atop the cat’s back. Posted on Jezebel, the image raises some interesting questions. Namely, is this an adorable example of domesticated bliss between animals that in the wild would be natural enemies? Or is this the troubling “before” picture of a pending massacre? To be fair, cat and chick friendships are far from unprecedented. In this video, viewed over 800,00 times since it was posted at the end of August, a ginger kitten is in a very similar situation — buried in a pile of incredible fluffiness. For yet another example of cat-chick adorableness, meet Oscar and his fluffy friends (names unknown). They are the stars of a now-famous Youtube series that shows the ins and outs of a very unconventional relationship. US researchers say that mice may have the ability to learn songs based on the sounds they hear. They found that when male mice were housed together they learned to match the pitch of their songs to each other. Mice also share some behavioural and brain mechanisms involved in vocal learning with songbirds and humans, say the researchers. But some scientists are sceptical, saying the evidence does not support the claim. Details of the study are published in Plos One journal. Previous research in this field has shown that male mice can sing complex songs when exposed to females and these play an important part in courtship. These murine serenades are ultrasonic. At between 50 and 100KHz, they are far above the hearing range of humans. When processed to make them audible to humans, they sound like a series of plaintive whistles. I am reminded of the singing mice in the Babe movies, some of my faves. “These dogs are sweet natured, loyal and loving,” Patricia explains. And she should know. After all, at any given time more than 150 of these dogs, many of them dumped at the shelter gate, find a soft landing at Sanctuary Evolucion’s extraordinary rescue center that is redefining the care of shelter dogs. When you walk up on this center, you don’t see rows of anxious dogs crying out from kennels. Not a chance. This is a place of peace, and it has the feeling of home for the dogs who feel safe here. The dogs are housed in 15 separate enclosures across the property and live compatibly in packs. They run free. There is also a puppy enclosure. Each enclosure has a large, airy shelter and shade and all the dogs are protected from the sun and rain. And with a Paws on Pavement program, walking groups are used to socialize the dogs and to get them comfortable walking on a leash outside the shelter.